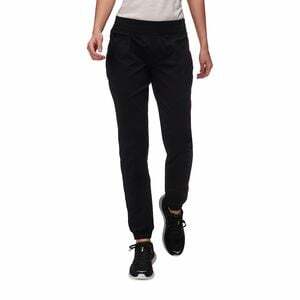 Product Condition: The Wander More Jogger - Women's is in Excellent condition. These joggers were previously owned for three weeks. The following observations were made regarding these item. *They were tried on in indoors for an occasion. *There aren't any defects in them at all. *Vendor tags are still attached on them. *They got minor pet hair/lint/dust, cleanable. *All items sold as is, all warranties void. Whether you're hitting the streets or the trails, do it in comfortable style with the Columbia Women's Wander More Jogger pants. Constructed with sleek style and a classic jogger fit, these pants keep you cool and dry as you blaze new trails on the mountain and keep you looking chic and stylish in the city. Paired with your favorite tee and some sneakers, the Wander Mores show that they can stand their own in your everyday life as well as on hikes or outdoor adventures.